To know Jatonne is to love Jatonne. "Growing up, I always thought there was a certain way people thought I should look…a certain way people thought I should be," he explains. Music has always been his way of connecting with others, and it makes him feel more comfortable with himself. He admits that his identity has been a bit of a struggle over the years. Native by birth, he grew up in an adoptive Native American home. He found out he was adopted when he was eight. "One day my older sister, 12, said to me, 'Do you know you are adopted? Don't tell Grandma I told you,'" Jatonne, a member of the Cheyenne River Sioux Tribe, says with a broad grin. Of course, he ran to his adoptive mom and asked her, straight up: "Am I adopted?" and she told him he was. Jatonne admits that he didn't understand what it all meant, so the news didn't devastate him. But over time, he began to wonder. "The older I got," he says, "the more questions I had in my head: Why did they [biological parents] leave me?" Fortunately, Jatonne reached beyond those questions and carved his own pathway. He graduated high school and went to school in Arizona for sound engineering. Fiddling with his hat and leaning back in the chair, Jatonne proclaims, "The way I look at life is that you have to take chances to actually live." And, he has. Jatonne set off from his home in rural South Dakota for The Conservatory of Recording Arts and Sciences in Phoenix, AZ. He was armed with a major scholarship from our partner, St. Joseph's Indian School. However, when he arrived in Phoenix, the apartment he was to rent for the semester fell through, and he worried he would be homeless. True to Jatonne's view on life, though, the chance he took paid off—he found an apartment and a job. He completed the degree program and has options for the future. He plans to use his degree in sound engineering to record his own music. "Music is my way of letting things out…when I write something that means something to me, I just hope that when I show it to someone, it means something to them." 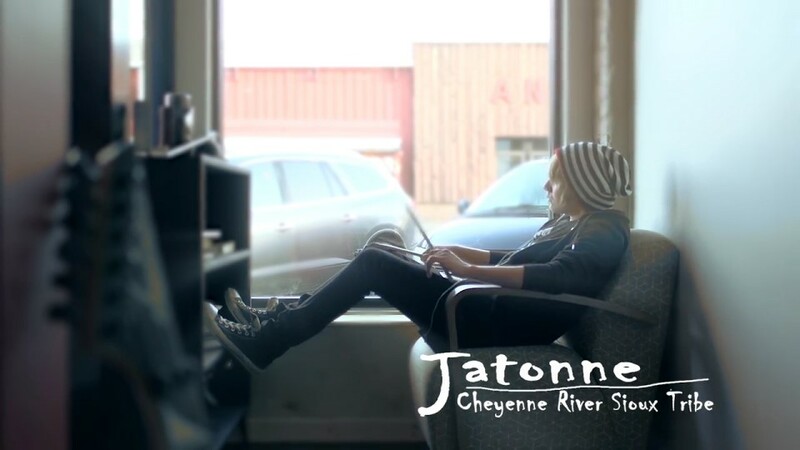 Jatonne's music comes from his soul and hits the ear with a vibrancy that is raw and real. He has spent his young life staying true to himself. Jatonne doesn't mince words, and he does not make excuses for mistakes but hopes to learn from them. He is talented. He is a rebel. He is kind. Jatonne wants others like him to remember to "just do it. If you want to learn, learn—whether it's basketball or guitar. Start something for yourself." Native Hope helps share empowering stories that dismantle barriers for Native Voices unheard, empowering Native American's, like Jatonne, to turn their dreams into reality.